Today is the day when you, the hidden object puzzle adventure genre funs, have a chance to enjoy another great game. Dark Parables: Rise of the Snow Queen follows the events of the old fairy tale by Hans Christian Andersen that fits the Christmas season perfectly. 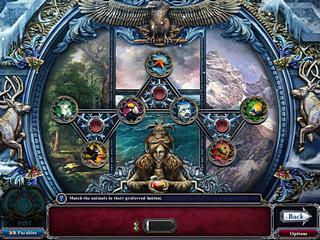 The game has a fair amount of hidden object levels and is also full of all kinds of puzzle to solve along the way. I don't think you need to be told the story itself because all of us know who did what and what was the end. I'll just say that the game presents the game in a really nice way with gorgeous half animated graphics and wonderful voice-over. This game is one of those that will meet the requirements of a gamer who has seen way too many games of this genre. It is obvious that lots of work has been put into it. Plus there are three difficulty levels for those who want it not only to look and sound great, but also actually challenge. 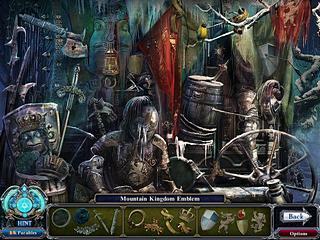 The game has a fair amount of hidden object levels. Most of the lists there show you the items you are to find, rather than just their names. There are hints to help you find them when you are stuck. The game is also full of all kinds of puzzle to solve along the way. They were fun to play. Most probably you won't want to skip them. The option is available though. All that is part of the genral quest where you pick up lots of items to use them on your journey and interact with all kinds of characters. All in all the game is awesome with everything it offers. If you are anything like me and don't really appreciate the creepy demonic games, you will enjoy this one. This is Dark Parables: Rise of the Snow Queen review. Download this game here.